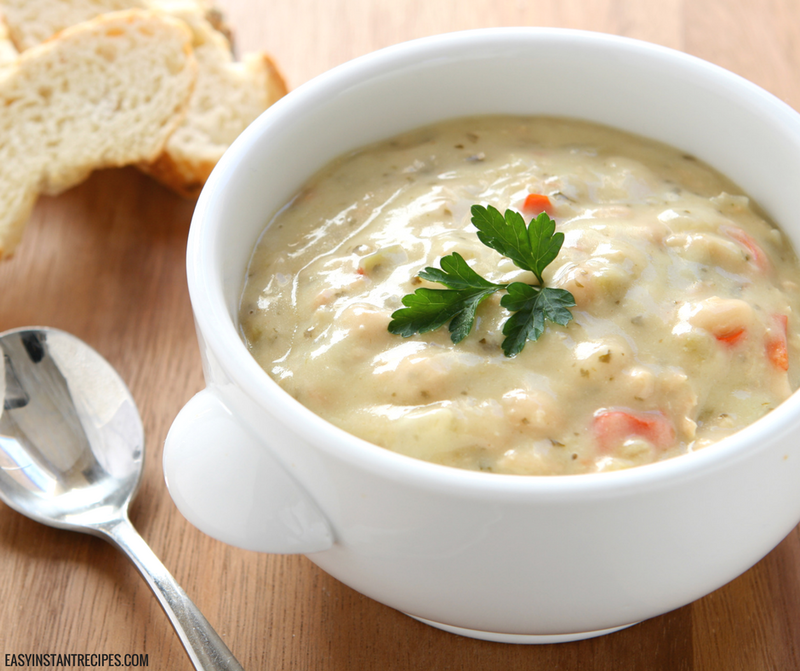 This Instant Pot Creamy Chicken and Rice Soup is the PERFECT soup to warm you up on rainy days! Inside: This Instant Pot Creamy Chicken and Rice Soup is the PERFECT soup to warm you up on rainy days! Make some creamy chicken, mushroom, and wild rice soup in less than 15 minutes with your Instant Pot, and your whole family will love it! Scratch that. It’s absolutely pouring outside. The kind of rain that makes you wonder if it will ever be sunny again. The kind of rain that makes you want to snuggle up with some tea and a good book. You know what else I always need in that kind of rain? And this Instant Pot creamy chicken and rice soup fits the bill perfectly! This creamy chicken and wild rice soup is my go-to recipe for rainy spring days! It’s smooth and tasty, and it takes only a few minutes to throw together in the Instant Pot. 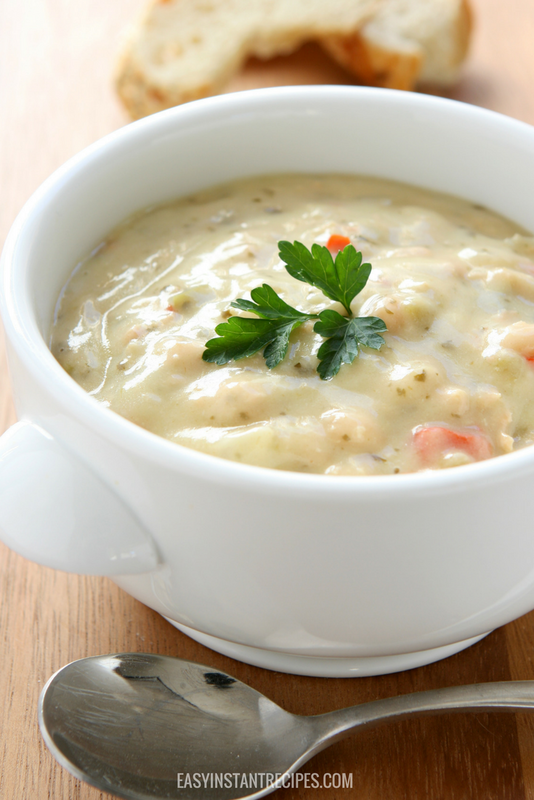 I can have healthy creamy chicken and wild rice soup ready for lunch even on the busiest days. It also makes the perfect dinner after soaking in the rain at your kids’ sports practices. Once you make this creamy chicken, mushroom, and wild rice soup for your family, get ready. They’ll be begging to make it a regular part of your Instant Pot meal plan! You won’t mind too much, though, trust me. Partly because you’ll think it’s so delicious yourself, and partly because it takes less than 15 minutes start to finish! Serve it with some bread on the side, and you’ve got a complete meal in almost no time. This pressure cooker chicken and rice soup is bound to warm you right up on rainy days, so that you can spend your time enjoying your book or a good movie with the family. The point is: In just fifteen minutes, you can have Instant Pot creamy chicken and rice soup ready for your whole family to enjoy. And the leftovers make a great lunch for the next day… If you can keep from eating the whole thing, that is! Set pressure cooker to sauté mode. Once hot, heat cooking oil. Add garlic, salt, pepper and cut chicken. Stir until chicken is about half cooked. Add uncooked rice, chicken broth. Mix well. Cover and set pressure cooker to cook on high pressure for 8 - 10 minutes. Allow longer if using wild rice. Quick release. Add cream, stir. Add carrots and mushrooms. Cover and cook on high pressure for another 2 minutes. If you’re not making this creamy chicken and rice soup for dinner tonight, you’ll definitely want to pin it for later so you don’t lose it!